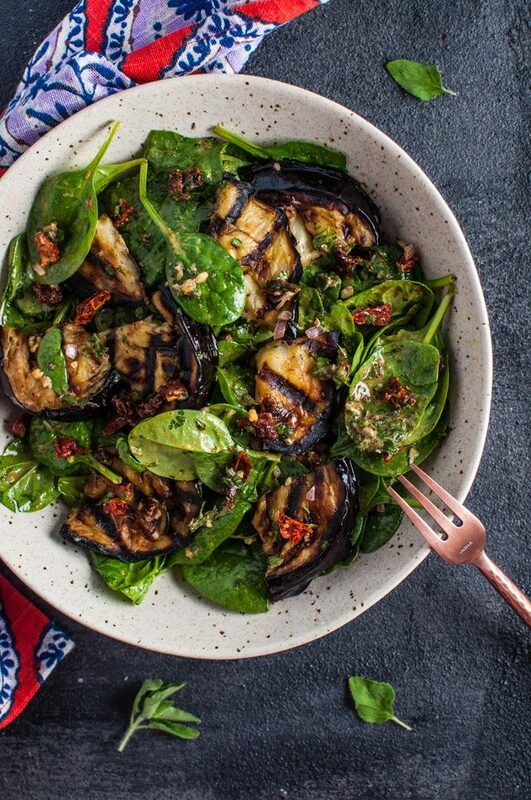 A flavorful and healthy spinach salad with smoky grilled eggplant. Slice eggplant in 3/4" inch thick rounds and lightly salt both sides of each slice. Let it sit for a while so some of the bitter juice is released while you prepare the rest of the salad. Make the salad dressing by combining all dressing ingredients and whisking them together (I like to add the oil in slowly, bit by bit). Set aside. Heat up BBQ/grill to medium-high heat. Prepare the other salad ingredients (chop the herbs, sun-dried tomatoes, and shallot), and add them and the spinach to a large salad bowl. Brush both sides of each eggplant slice with olive oil prior to grilling. I don't rinse the salt off the eggplant or anything, but you can if you're watching your intake. Grill eggplant on medium-high heat for approx. 3-5 minutes per side (really depends on your grill). The eggplant should be browned and crispy on the outside and soft and tender on the inside. Let eggplant cool for a few minutes, then cut each slice into quarters. Add the eggplant to the salad and toss everything together with the dressing. Serve immediately. Serves 2 as an entree-sized salad or 4 as a side salad.